PHILADELPHIA, Pennsylvania (October 10, 2018) – The Buccini/Pollin Group announced that leasing is officially underway for The National, a new mixed-use residential and retail project in Philadelphia’s historic Old City neighborhood. The six-story building features 4,000 sq. ft. of retail space, and 192 residential units equipped with best-in-class amenities, contemporary design elements and high-end finishes. With furnished model apartments now available for viewing, future residents are invited to experience the exceptional lifestyle that The National has to offer. The community will be ready for occupancy this November. 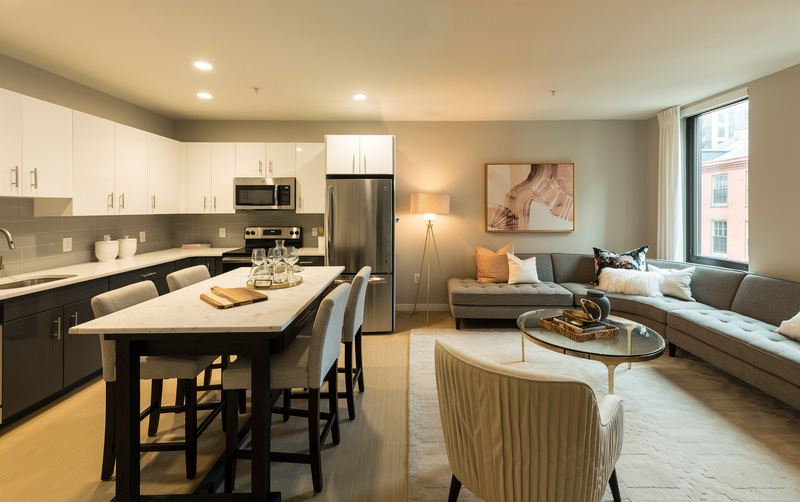 The National offers a variety of apartment layouts to meet the individual needs of each renter, including studios, one bedrooms and two bedrooms. All residences feature gourmet kitchens with quartz countertops, GE stainless steel appliances and modern subway tile. Units also come equipped with a washer and dryer, oversized full-length windows and luxurious baths. Residents will have access to indoor and outdoor community areas as well, including a two-story clubhouse with a demonstration kitchen, co-working space and lounge, a Technogym fitness center and a convenient pet spa and grooming station. In addition, the property contains four outdoor spaces including two landscaped courtyards, a park along historic Elfreth’s Alley and a rooftop deck complete with an outdoor kitchen and living room, as well as stunning views of Center City and the Delaware River Waterfront. An attached garage with parking for up to 60 cars will also be available for resident use. Located at 121 North 2nd street, between Arch and Race Streets, the property’s superior location is at the center of Old City’s thriving cultural scene. The city’s most iconic historical sites, highest concentration of art galleries and top dining and shopping destinations are all within walking distance. The building is also within close proximity to Philadelphia’s public transportation system and major roadways. The National is a collaborative project between The Buccini/Pollin Group, Barton Partners, TN Ward Company and ResideBPG. For leasing information, please contact the National Marketing and Leasing Office at (833) 430-3607 or visit thenationaloldcity.com. To set up an interview with a representative from The National, please contact Devan West at dw@neffassociates.com or 215-627-4747. The National is a new mixed-use rental residence being developed in the Old City neighborhood of Philadelphia, PA at the former site of National Products restaurant-supply business. When complete, the six-story building will boast a re-creation of the site’s iconic orange tile facade and the original stainless steel signage that stood out for decades along 2nd Street. The building will have 192 apartments and 4,000 sq. ft. of retail space as well as impressive amenities such as a rooftop deck with city and bridge views, a pet spa and a 2-story clubhouse. Apartment residences will be equipped with high-end finishes including gourmet kitchens, oversized windows and luxurious baths. 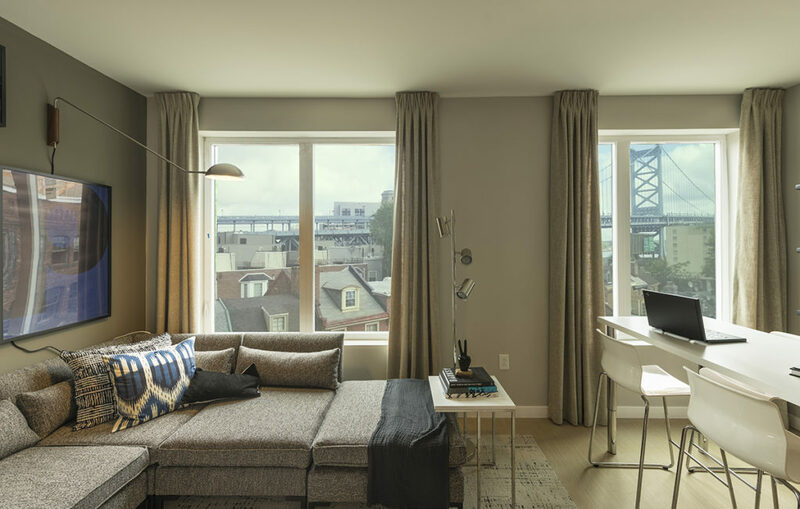 The National is developer The Buccini/Pollin Group, Inc.’s first apartment venture in Philadelphia. Barton Partners served as The National’s architect, TN Ward Company as general contractor and ResideBPG as building manager. Celebrating their 25th anniversary, The Buccini/Pollin Group is a privately-held, full-service real estate acquisition, development and management company with offices in Washington, DC, Wilmington, DE, Philadelphia, PA, and New York City. Since 1993, Buccini/Pollin has developed and acquired hotel, office, residential, sports & entertainment, and retail properties throughout the Mid-Atlantic and Northeast having a value in excess of $5 billion. The Buccini/Pollin group currently has under management or development 40 hotels including the nearby Sheraton Society Hill and Renaissance Philadelphia Downtown; 7 million square feet of office and retail space; 12 major residential communities; and multiple entertainment venues, including Talen Energy Stadium, home of the Philadelphia Union Major League Soccer team. Buccini/Pollin’s 2,000 associates make a difference in our communities by supporting over 50 vital charities. For more information, please visit www.bpgroup.net. BPG Residential Services, LLC (ResideBPG) is the premier full-service residential management and leasing company formed to complement Buccini/Pollin’s residential investment objectives. The company currently operates a portfolio of 3 residential brands comprised of 12 apartment communities, 1,600 unfurnished apartments and 85 corporate furnished apartments. From high-rise luxury residences overlooking the Christina River, to urban walk-ups along Market Street, to LuxiaSuites, the premier corporate furnished community in Northern Delaware, ResideBPG has an extensive variety of communities and an unyielding commitment to quality. The Buccini/Pollin has also completed 373 “for sale” properties along the riverfront in Wilmington, and currently has 4 additional residential development projects on the boards, totaling an additional 1,160 units. For more information, visit www.residebpg.com.